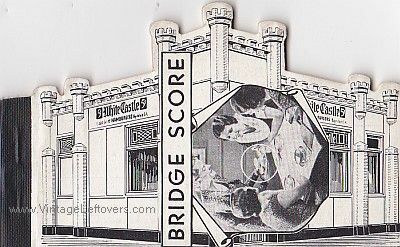 These two (2) vintage WHITE CASTLE Bridge Score Pads are dated 1935! It’s 20th Century advertising memorabilia at its best! 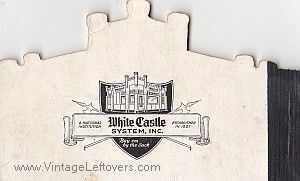 Classic die cut images of the WHITE CASTLE RESTAURANT are pictured on the outer and inner covers. Inside are 25 formatted pages for scoring your bridge or card games. Measures 4 5/8” wide x 2 7/8” tall. Condition is very good, with tight, stapled binding, and all covers and pages are without folds or highlighting. One book is missing two pages and the other book has some slight pencil marks only on the first page. No other marks appear on the inside or outside. Pads may show some wear that is natural to all vintage paper items. Item ships First Class with Free Tracking!